"Project Success is in the delivery of a Project Output that meets Clients expectation with Maximized Efforts"
"Victory is ensured for well-matched project management methodology and the right type of Project"
A Project is a collection of activities like planning, executing, implementing and monitoring for an expected outcome. Project Managers who handle all the various activities to provide the clients’ required output is called Project Management. Project Managers plan, assign, execute, monitor and document the various stages and are responsible for making sure that all this is done without any hindrance. While they are managing a project there are a lot of methodologies that can be used. Here are some popular and not popular methodologies that Project Managers can use in their business practices. Project Management practices has a few common project management methodologies which is known in the business circles. This is the oldest form of Project Management that is mostly used in the Software development. This method is now replaced newer versions of managing a project. This method believes in having fixed and linear timelines for the project development lifecycle. 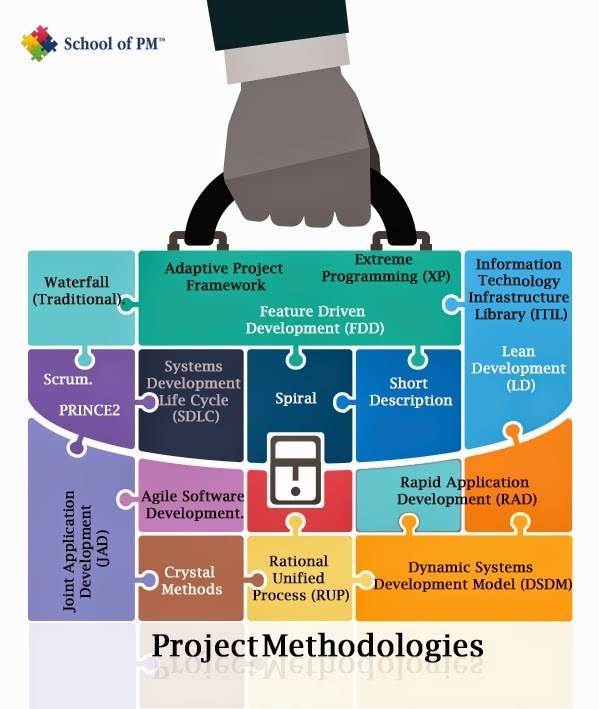 The Agile Methodologies believe in being very clear about its project requirements. The agile method believes in short-term delivery cycles or Sprints and with each iteration a new additional features are produced. It requires dynamic work culture, non-restrictive project control and excellent immediate communication. As part of the Agile Methodology, the central focus is to provide improvised team productivity. The hurdles in the way are removed by Scrum Masters who are in-charge of the scrum projects and they ensure that the team functions smoothly without any hitch. As part of the agile category, this method gives prime focus on team communication, skills and interpersonal team interaction. The processes itself is given low priority. The central aim of Extreme Programming is to bring down the cost of project requirement changes. This continuous process places importance on fine scale feedback with shared understanding which ensures programmers’ well-being. XP works with low detailed specification on software architecture build. In this method the project scope changes to adapt to the project time and cost. Project Managers given cost values for Time and cost which means the project scope is adjusted to bring out the maximum output based on the given inputs. This method aims to develop products quickly while maintaining their high quality. Workshop method is used for gathering requirements and Prototypes are created to clarify them. The software components are recycled to speeding up development timelines. The mode of communication among the team is usually informal. This methodology was an upgrade of RAD method. It is also considered as the subset of Agile Methodology. It provides strong training and documentation support for the project. The end-user is involved in the project right through the entire project lifecycle. This methodology is focused on clear and simple processes with feature driven delivery cycles that are short progressively improving versions. All project plan and execution are based on features. As a collection of best practices in project management, the ITIL spans across the wide spectrum of all project management. It starts right from the organizational management level and goes downwards to the last member in the production loop. All throughout the project life cycle, the JAD holds sessions of collaboration with their clients to keep the focus client-centric. Since there is an involvement of client at the early stage, there is a strong influence of client based requirements on the project tasks that gets assigned to the project team. In order to provide the highest value for the Customer’s money, the team is focused on developing software that are prone to change-tolerance. Customer satisfaction becomes the foremost priority of the Project Managers and their teams. This methodology is strictly based on the eight high-level processes to make sure that the project arrives at its closure. As the name suggest it takes into account all the various modern software development methodologies and unifies them into a single process. This method was the first one to suggest an iterative approach for software development. This method uses waterfall model while also using prototyping of the project at each level. This is used for larger projects and is an extended waterfall model. This method relies heavily on documentation and following strict guidelines. The method combines two or more project management to bring out the best product through the project management process. Project Managers are in a place where they should pick the right kind of Project Management methodologies and bring out the best project output that provides client satisfaction. Pick a methodology that best suits you clients’ and project teams’ need.